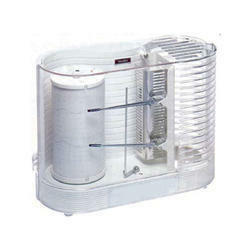 We are a leading Wholesale Trader of thermo hygrograph from Mumbai, India. We are involved in importing and supplying a quality range of Thermo Hygrograph. These are manufactured using quality basic material and are extensively used in public areas for recording temperature and humidity. Our range of products is widely appreciated for high performance and low maintenance and are offered at industry leading prices. Precision Thermo-Hygrograph Isuzu Japan, Model : Thr-1-2, Humidity Range; 0-100% RH, new improved model with push button type On/Off daily & weekly switch for easy & visible operation supplied With (55) dial & (400) weekly chart paper (1) ink bottle (4) ink pen & instruction manual. Digital Rain Gauge with In/Out Thermometer, Model : RGR - 126. OREGON Scientific. Looking for Thermo Hygrograph ?